Doug, WAØVEZ, gave a demonstation on hot air ballooning at the September club meeting. With the assistance of some pilots of the Roscoe BBQ hot air balloon group, a hot air balloon was set up and inflated near the American Red Cross building. 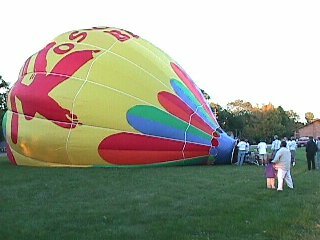 After the balloon inflation, Doug answered questions from club members on the sport of hot air ballooning. 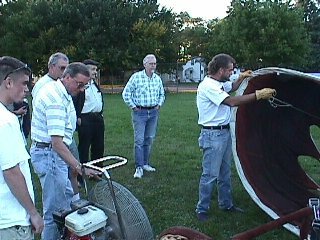 Doug WAØVEZ (second from left) adjusting the fan to begin inflation of the balloon envelope. The hot air balloon begins to take shape. 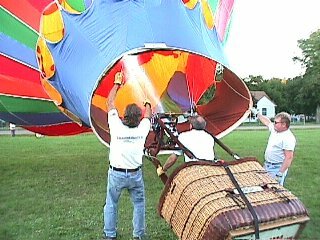 Doug WAØVEZ operating the burner to place hot air into the balloon envelope. The burner puts out a "couple" million BTUs of heat!! 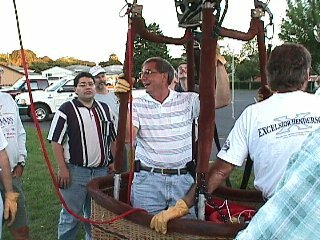 Doug, WAØVEZ, sitting in the hot air balloon basket and answering questions from club members.